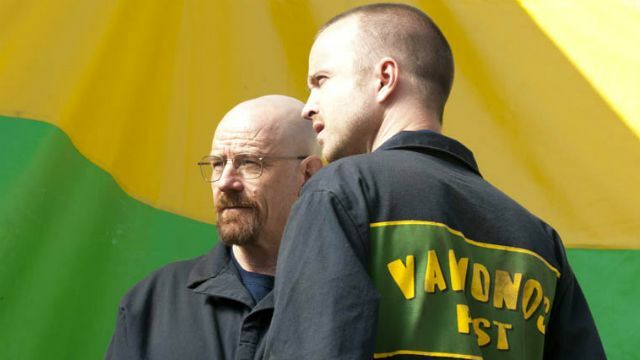 To the credit of a show like Breaking Bad, even transition episodes can explore important thematic elements of the entire series: trust and loyalty. ‘Hazard Pay’ opens with Mike assuring his imprisoned former employees that they can trust him to continue their agreement of financial compensation in return for silence. In other words, Mike seeks trust in exchange for loyalty. Trust and loyalty are concepts that Mike still values and seeks to protect. 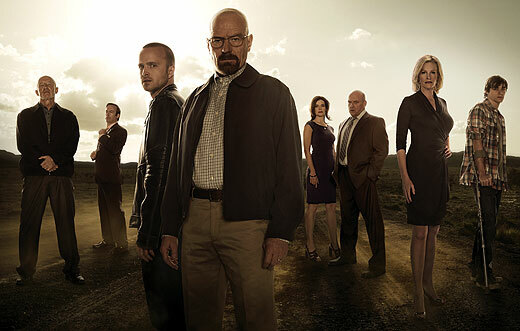 Once again in contrast to Mike is Walter White. He begins the episode by manipulating Jesse yet again, using issues of trust and loyalty as weapons. 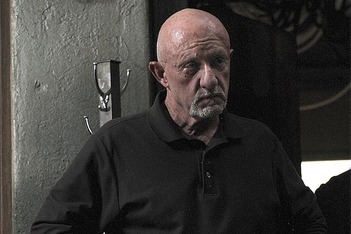 By a few carefully worded questions, Walt casts doubt about how much Jesse may be able to trust Andrea. Jesse’s biggest fear is living with his misdeeds and being accepted by others in spite of them, showing their true loyalty to Jesse the person. Walt cleverly plays on this fear using the ‘trust’ he has built with Jesse to question the loyalty of others once they find out about the ‘real’ Jesse Pinkman, the murdering drug addict. So, Mike sees trust and loyalty as qualities that must be upheld at any personal and financial cost. Walt sees the concept of trust as something to be manipulated and coerced into a benefit for only himself. As another example, when Marie enters the fray this week, it is no surprise that Walt uses Skylar’s extra-marital affair, an issue of trust, to ensure the loyalty of Marie toward himself. This also allows Walt to maintain the secrecy of the source of the White family’s dysfunction, himself. The cost of good business. Boy, even with the old kingpin out of the way, it sure seems like a lot of people have to know about what you are doing. A lot of eyes looking around. 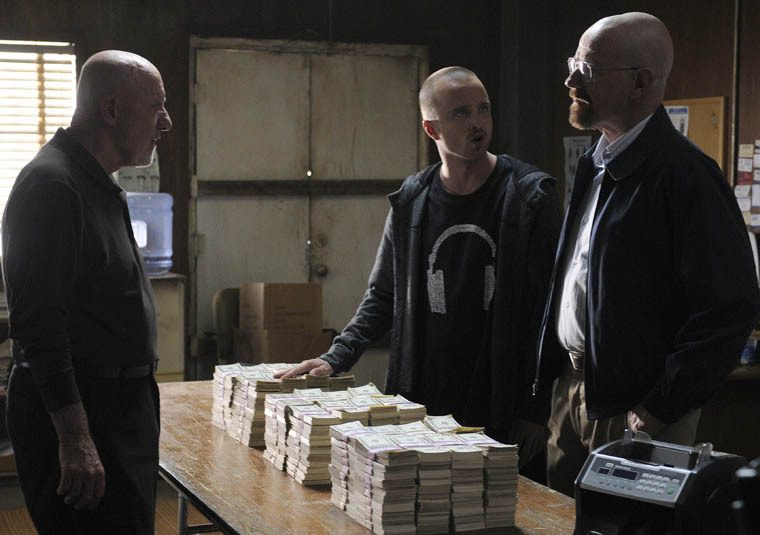 As has been teased in the first two episodes, Walt and Jesse are now looking to re-establish their operations. Mike is back in as well. And as he succinctly puts it, he is charge of the business side. A new arrangement between the three (sadly, Saul is not the third Amigo, as he thought) is cautiously worked out based on a very precarious balance. Their first job: they need to find a new location to cook. In a great sequence, one that illustrates Breaking Bad’s attention to peculiar details, we see our trio (escorted by Saul, real estate agent to the underworld, apparently) checking out venues from which to run their operation. Walt and Jesse are concerned with the chemicals in the air; the steam, the salt, the exhaust. While Mike worries himself about who is on-site, who needs to be paid off, who they can trust. After the more harrowing scenes of the first two episodes of the season, this third episode is clearly one of careful buildup. There is no frenetic action, the suspense is muted, but the existential dread is still there. With an intro that suggests an effort being made to calm the waters, Mike makes clear to an associate in jail (one of ‘his guys’) that he will be repaid and “be made whole”. The ripples from Gus’ death continue to extend outward and Mike, ever the professional, is hellbent on minimizing the damage as well as the number of people involved. He understands both the risk and reward of a solid trust built in business. Meanwhile, Walt and Jesse operate differently. In a great callback, we see Jesse meet up once again with lovable losers Badger and Skinny Pete (who plays piano!). Once inseparable, now it is clear that Jesse sees the risk involved in including them in his work. After all he has been through, he has matured (such as it is) far beyond what they’ll understand. Speaking to that maturity, Jesse realizes he should also distance himself from Andrea. Of course, he arrives at this conclusion due to Walt’s careful manipulation of the faith he has in their partnership. Moving forward, Walt continues to believe himself to be beyond reproach. He does not worry about what Skyler may do, he has an answer (a tremendously clever and devious answer) for Marie’s searching inquiries. He continues to elude Hank. He tells Jesse he trusts him, but it is clear that he trusts only himself. I would be remiss to not mention the delicious, out-sized image of Walt (and family!) watching Scarface. Is it perhaps too obvious for Walt to be watching a drug kingpin, isolated and alone, being gunned down in his own house? Or is it more frightening to think that Walt, much like his mentioning of Icarus, will continue to fly closer and closer to the sun, alone and seemingly unburdened, believing himself to be safe?